The chapter first highlights the long history of how gender has become involved in the invention of the household appliances, for example washing machine. The complex relationships between household economy and market economy are here detailed, showing the presence of economy even in mundane household activities. Next, the pervasive gender inequalities in science, research and technology are put into a global focus from the perspective of patenting activities, in both academic and business contexts. Some remedies for improving women’s relatively weak position concerning the gendered nature of patenting activities are then evaluated. Need to reform educational systems from early childhood education to academy is obvious, but strong and general cultural association of STEM subjects with masculinity makes the task difficult. Lastly, widening the field to include, for example, social innovations directs attention to complex questions of research policy and gender. Abreu, M., & Grinevitch, V. (2017) Gender patterns in academic entrepreneurship. The Journal of Technology Transfer, 1–46, doi: 10.1007/s10961-016-9543-y. AHAM (2016) Association for home appliance manufacturers. www.aham.org. Retrieved 4.10.2016. Breakthrough Prize (2016) General introduction. www.breakthroughhprize.org. Retrieved 25.5.2016. Esporta (2013) Evolution of washing. www.esporta.ca. Retrieved 21.6.2016. European Commission (2013) She Figures 2012: Gender in Research and Innovation. Brussels: European Commission. Available at: http://ec.europa.eu/research/science-society/document_library/pdf_06/she-figures-2012_en.pdf. European Commission (2016) EU Prize for Women Innovators. http://ec.europa.eu/research/innovation-union/index_en.cfm?section=women-innovators. Retrieved 10.12.2016. EU women innovators (2016) Accessed 3.4.2016 at http://ec.europa.eu/research/innovation-union/index_en.cfm?section=women-innovators&pg=who. Greatest Engineering Achievements (2016) Household appliances history, part 3 – vacuums and fans. http://www.greatachievements.org/?id=3775. Retrieved 1.3.2016. Horizon (2013) Interview of the laureate of the 2013 FEBS/EMBO Women in Science Award, Dr. Almouzni. The EU research and innovation magazine. https://horizon-magazine.eu/. Retrieved 15.5.2016. Museums Victoria (2016) Item ST 26358 Washing Machine – Bendix, Automatic, circa 195. Museums Victoria Collections http://collections.museumvictoria.com.au/items/415562. Accessed 28 November 2016. Nager, A., Hart, D. M., Ezell, S., & Atkinson, R. D. (2016) The demographics of innovation in the United States. ITIF. Web-version: http://www2.itif.org/2016-demographics-of-innovation.pdf?_ga=1.194345133.1854841563.1452803793. Retrieved 12.March 2016. Nobel Prize (2016) Prizes and Laureates. www.nobel.org, accessed 15.1.2016. Schiebinger, L. & Klinge, I. 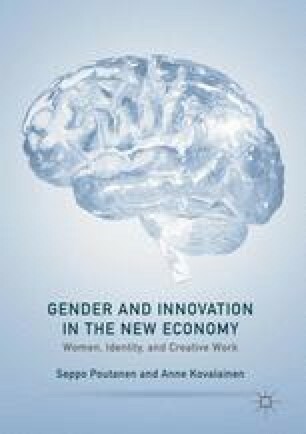 (2013) Gendered Innovations. How Gender analysis Contributes to Research. Directorate General for Research & Innovation. European Comission. Accessed on 14th February 2016 from http://ec.europa.eu/research/science-society/genderedinnovations/index_en.cfm. Statistics Finland (2016) Employment Statistics. www.stat.fi. Retrieved 12.6.2016. Technology Academy Finland (2016) Introduction and prizes. www.tat.fi. Retrieved 25.5.2016. The Economist (2014) Innovation awards: and the winners are…The Economist 6.12.2014. www.theeconomist.com. Retrieved 12.10.2016. Työtehoseura (2016) Työtehoseuran historiaa. http://www.tts.fi/tts-1/tts90vuotta. Retrieved 10.5.2016.